Roger Abrantes, born 04 September 1951 in Tomar, Portugal, is an ethologist (Ph.D. in Evolutionary Biology and Ethology, and BA in Philosophy, DHC, MAPBC) belonging to the school of ethology founded by Konrad Lorenz, Nico Tinbergen, and Karl von Frisch. He is the author of 27 books in English, German, Spanish, Danish, Swedish, Norwegian, Italian, and Czech, and numerous articles on behavior. He is probably one of the most versatile ethologists in the world. His work ranges from lecturing at Ethology Institute Cambridge to guest lecturing at universities worldwide, giving popular talks, training police officers, SAR teams, and rats to detect landmines in Tanzania (Apopo). 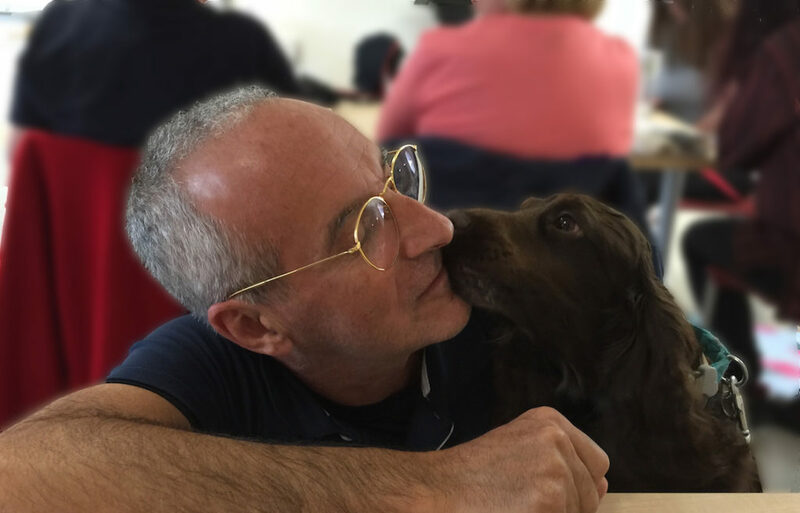 Roger Abrantes is particularly known for his meticulous approach to the study of behavior with concise definitions and logically sound argumentation; for his view on social behavior and its application to the understanding of pet behavior; and for his purposeful working methods, a functional merging of Ethology and Behaviorism. He is the creator of SMAF, an artificial programming language to describe learning processes accurately. Before he retired in 2018, he lectured in ethology, animal learning, and epistemology (theory of knowledge), and worked with dogs, horses, cats, Guinea pigs, and the Giant Gambian Pouched Rats. He was an instructor at CNCA (USA), and a special advisor for the GNR (Portugal), and participated in various marine environmental management projects (he is a certified Divemaster, Rescue Diver, and Sea Captain). He continues being a member of the Scientific Advisory Board of the DHVE (Germany), and a WEN Science Ambassador. Even though retired, he continues to work, now focusing on the philosophical aspects of evolutionary biology, writing articles and blogs, lecturing occasionally, and tutoring his particular students. 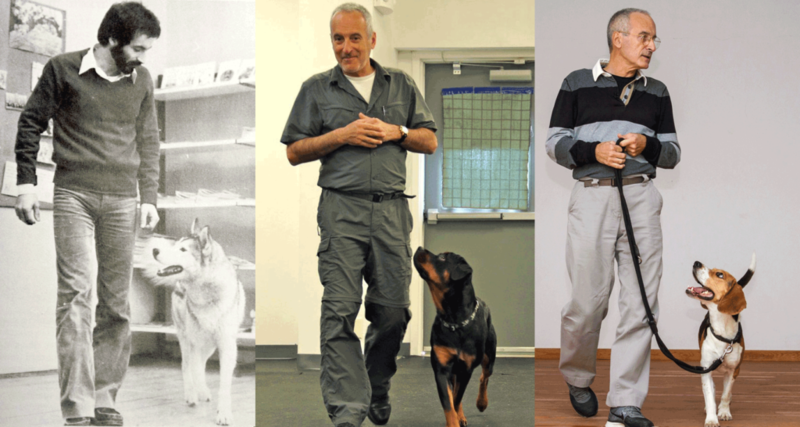 “Animal Training My Way”—Roger Abrantes from 1984 to 2014. (Photos by John Larsen, Lise Jernigan Bain and Cristina Brandão). Roger Abrantes has written popular books, theoretical scientific dissertations, and over 100 articles and blogs, and he is a popular guest on TV and radio programs in various countries. His English books, “Dog Language–An Encyclopedia of Canine Behavior” and “The Evolution Of Canine Social Behavior” became hits the moment they reached the US bookshelves. He often lectures in the US. Roger Abrantes is truly a citizen of the world. He holds two citizenships, Portuguese and Danish, and if you ask him where he lives, he will answer you, “Planet Earth.” His bases are Cambridge in the UK and Ao Phang Nga in Thailand. He speaks nine languages, English, Portuguese, French, Spanish, Danish, and Swedish (fluently), Italian, German, and Thai (less fluently). He has been a keen sportsman, having raced cars for many years and played roller hockey in the German Bundesliga where he was his team’s first goalkeeper until his 50s. Nowadays, he plays pool (8-ball and 9-ball), runs, sails, and dives. When he’s not working, he dedicates himself to his two life-long passions: reading (everything) and listening to music (Blues, Rock, New-Age, Opera)—and preferably on a sailing boat!